Changing up the kids bedrooms, I need opinions! Hello all! Whew, we made it through the holidays! My kids are back in school, my house has the ever present morning whirlwind that is three kids getting off to school. My brain is mush by the end of the night with homework, sport activities, and making sure I squeeze in all of the cuddles possible to my kids. Pretty much, we are living it up big and busy! Which means it is time to add more to my plate of course! 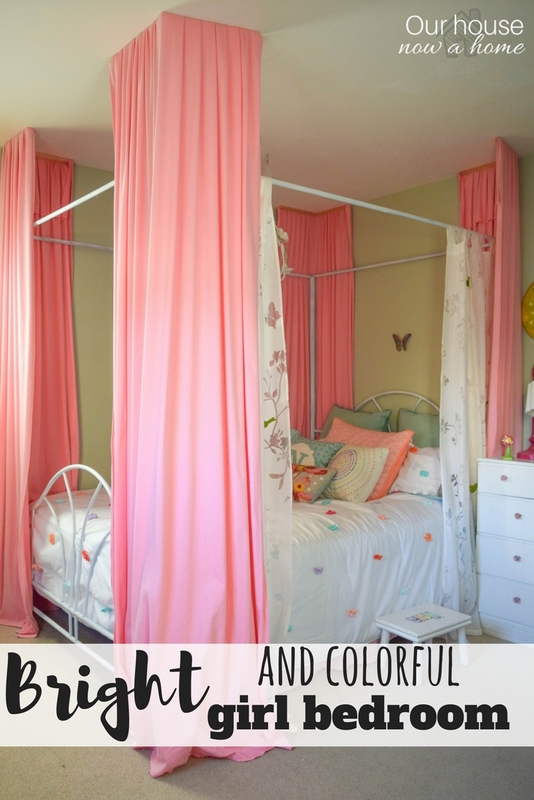 Today I am talking about Changing up the kids bedrooms, I need opinions! We have a three bedroom house, with a master bedroom and two kids bedrooms. My boys share a room and my daughter has her own room. Which seems like the perfect set-up. I redid Caleb and Gavin’s bedroom about 3 years ago. Putting in a lot of time and energy into making it just the way they needed it for their growing selves. 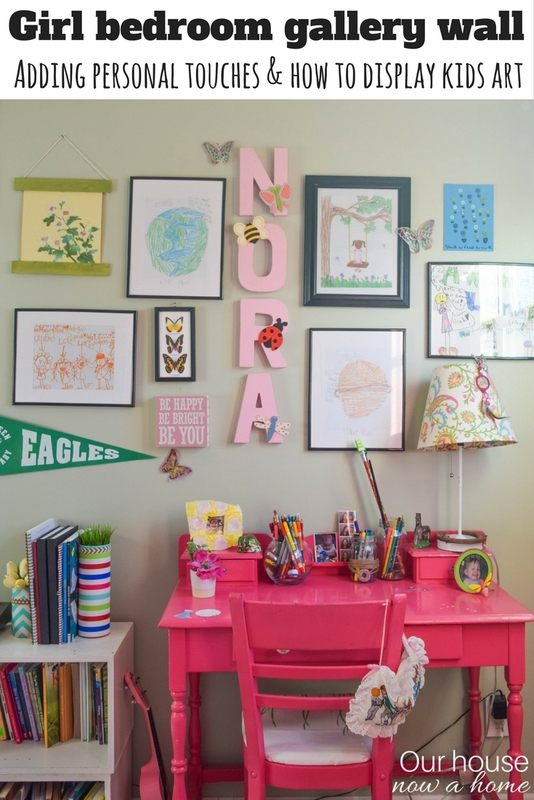 I also updated Nora’s bedroom last year, bringing in a bigger bed and creating a space that worked for her age. 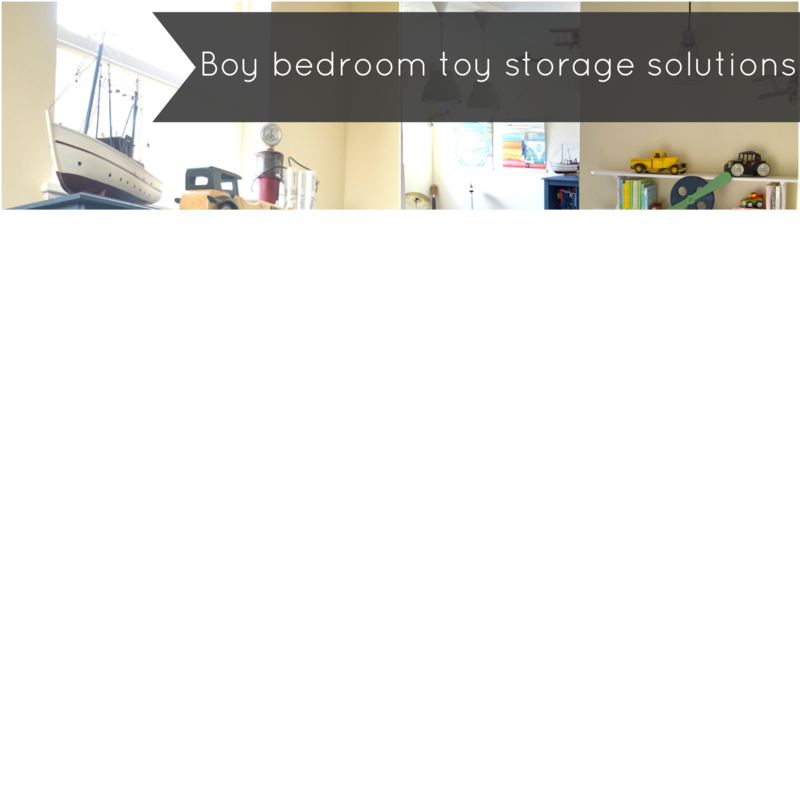 It all seemed perfect, a girly bedroom with tons of book shelves for my girl and a boy bedroom filled with colors and ample play space. However, behind the scenes it is different. My crew of kids are a close bunch. I do not know if they are closer than the average sibling group, I only have mine to compare. They are together all of the time! Moving from room to room as a unit. They are 9, 8, and 6 years old so are more or less in the same phase of childhood. They do fight, but it is small squabbles that they work out very quickly. We got lucky with these three, they are truly each others best friends. In fact it seems tat with each passing day they get closer as a trio, which makes this Mommy heart of mine burst with love and pride. With Nora having a bigger bed most nights they even all end up sleeping in her bed. It is the sweetest thing to see my kids cuddling up close at night! We have also had a few struggles of Nora feeling left out because her brothers have each other and they have their room together. My daughter will forever be disappointed we did not have a fourth child, a sister for her. I explained that we had a 50/50 shot of getting another boy, she still thinks we should have gambled with those odds. Ignoring the adult concerns of time, money, maternal health…… blah, blah, blah… she wants a sister! I get it, I do. I would imagine she feels a little left out when they are in their room and she feels excluded. My two boys have also mentioned that they do not like being separated from her at night. She is the only one in the house that is forced (their words) to sleep alone because my husband and I have each other and the boys have their room. So for months now my kids have been begging me to let them all share a room. They presented me with their plan and I nixed it right away. Three kids in one room? Um, why? How? Huh? No!!! But, I finally listened to them and really thought about it. This phase in their childhood of them being close will eventually fade away. My Mommy hope is that they will always remain close, but the time of them moving as a unit throughout our home is on borrowed time. I should embrace their closeness. 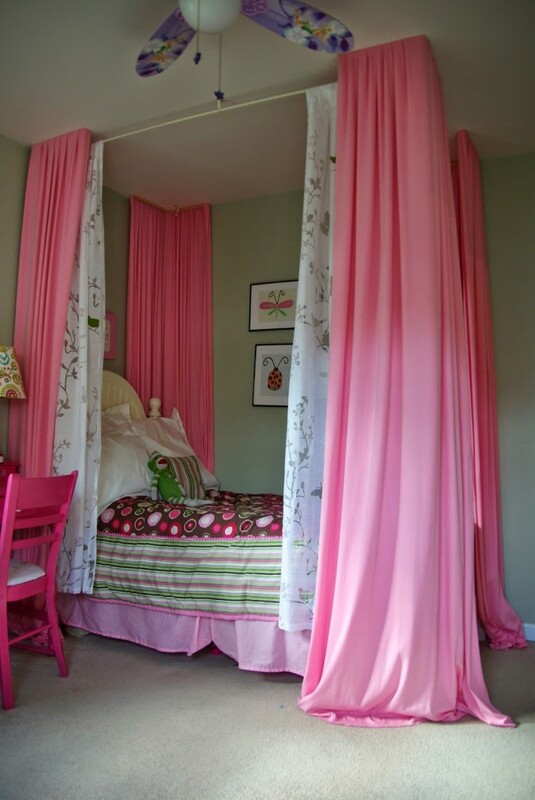 I also realized that I was hesitant for this idea because I love their bedrooms as they are. They are so cute and decorated adorably! Selfishly I do not want to remove all of the pink and blue decor. I would need to use what we have and alter some items to work for a more gender neutral style. Yes, when they have one friend over there will have to be come compromising on who gets the play room or who gets to hang out in the sleeping room. 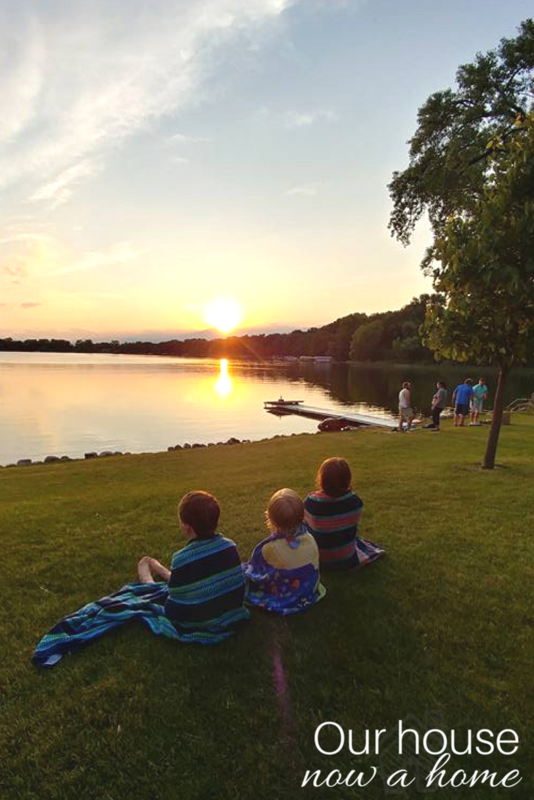 But even this is not too much of an issue, we live in a small town and with my kids being close in age most of their friends come over and they all play together. They have different ages that mix with other sibling groups, so even that is not too much of a problem. Privacy issues, they each already get dressed in the bathroom so no problem there either. Most of my gut reasons for saying no did not hold up once I considered our family dynamic and lifestyle. I was saying no simply because it is not what is done. 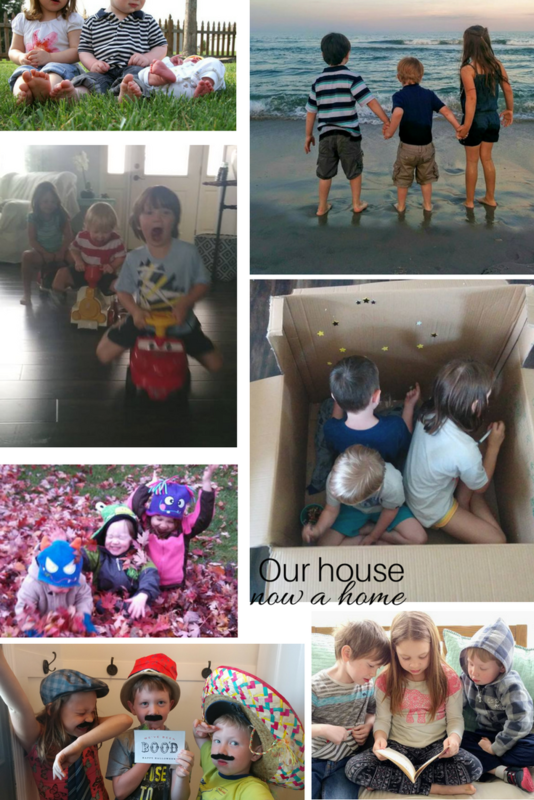 Three kids in one room by choice is not the norm, but who says our home has to be normal?!! Once I was open to the idea I had to figure out the logistics, how do I make this work while giving them what they want and keeping my sanity? Here is the plan I came up with; a sleeping room with three beds. 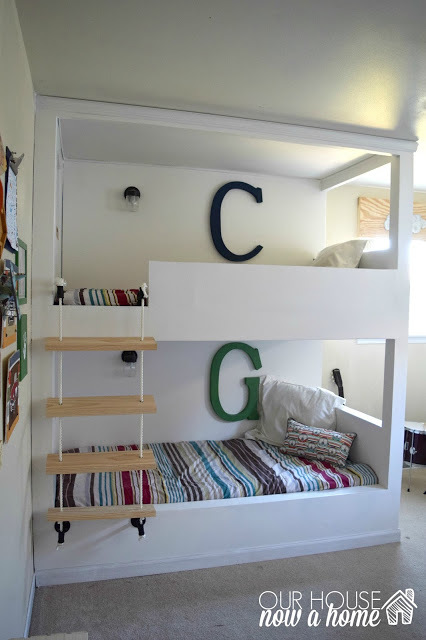 Using the boys bedroom with their built in bunk beds as that room then bringing back up Nora’s twin bed that we have stored in the basement as the needed third bed in the room. Then turning her bedroom into a kids play room. 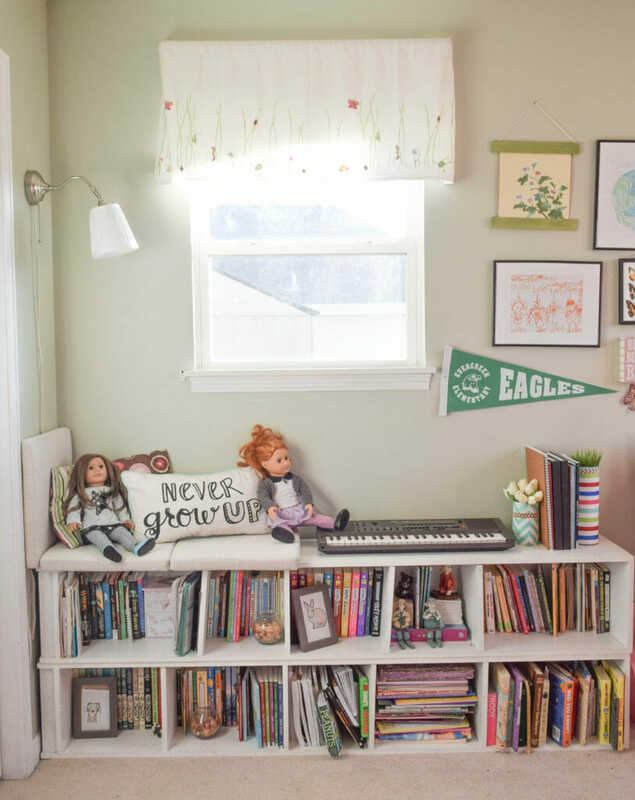 Putting all of their toys, books and art supplies into this room. We have had an art table for years in our sun room, and they spent hours there creating. When we rearranged our home and put the dining room table in their I separated their art supplied into each of the bedrooms. However, they still crave drawing together and have commandeered the coffee table in the living room for this purpose. 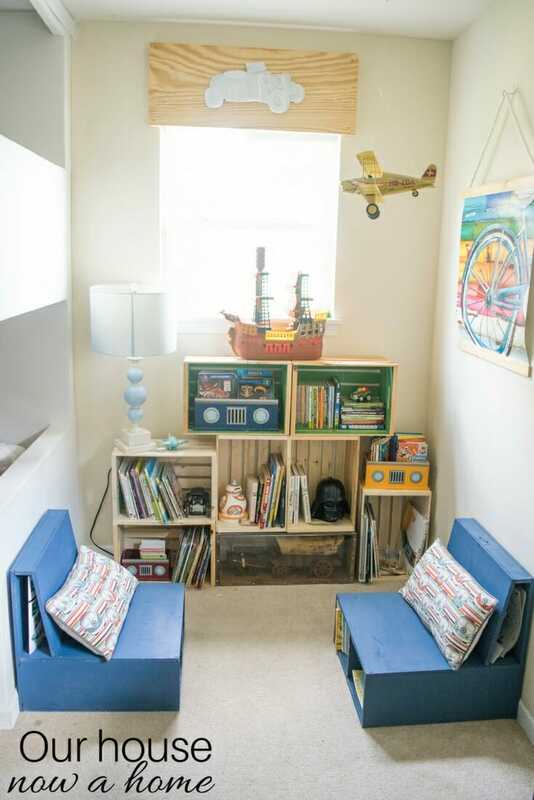 Making a corner for all of their art supplies and an art table in the playroom would be wonderful. The boys have a big walk in closet and if I kick my organizing into high gear I can most likely fit all three of the kids clothes within the closet. Which gives me a whole walls worth of closet to turn into shelving for their toys. My mind has been in overdrive on the possibilities! I gotta say, what was a crazy idea has turned into something I am really leaning towards doing. I have almost all of the furniture needed between their two bedrooms and a few items we have in the basement. 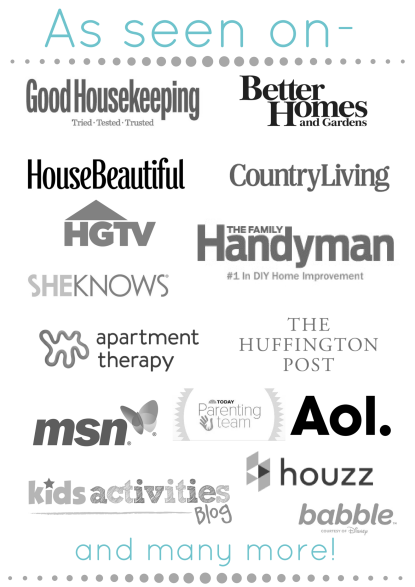 What we don’t have I can go DIY style and create. It would all be done with minimal-ish costs and effort. 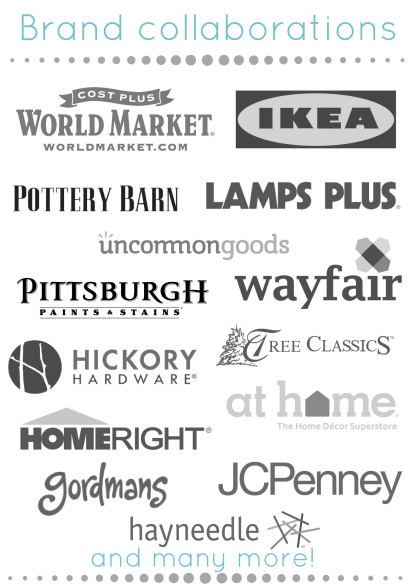 I am planning to reuse a lot of the furniture items in their bedroom, and the decor that does not feel gender neutral will either be sold in a rummage sale or if it is special items I can store until the rooms go back to being separate, which I know will happen eventually. I am reasonable to know that this room set-up has a big expiration date. I am betting we get two years out of it before one of them is ready for their own space again. But really, the way I have it planned I could easily change things back when the time comes. I have explained to the kids that if we do this they will need to stick it out for a while. There will be no changing it back in 6 months, no one has time for that! With my kids growing each day I have come to know that this time of life, this time of young kids and a loud house is a phase. I am painfully aware how quick time is flying by. My kids are so lucky to have each other and the fact that their personalities mesh together so well is what I hoped for when we had our babies close together. We planned for this, hoped, wished and craved for this very closeness that they are. Why should I stop them from having that? 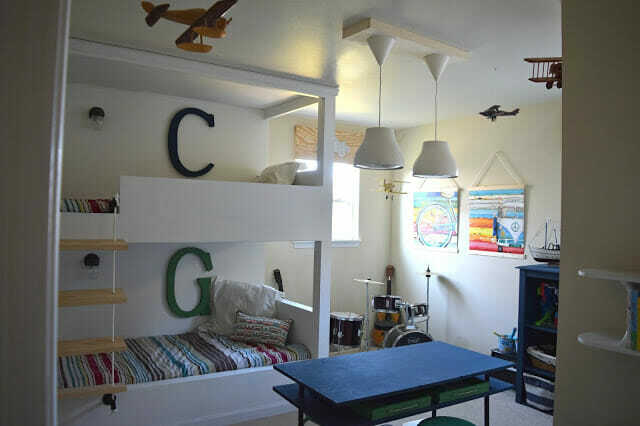 The memories made, whispers before falling asleep, giggles in the morning before waking us up, pretend games, art created and fun to be had in these two designated kids rooms will be worth the work. I have no clue on the timetable for this. I know my kids would like it done tomorrow. But with me being… well me… I am also going to paint the sleeping room (formally the boy bedroom) because the walls are in a rough state. I also want to make sure it all functions right, carving out little spots for their own personal treasures, notes, and toys to be. 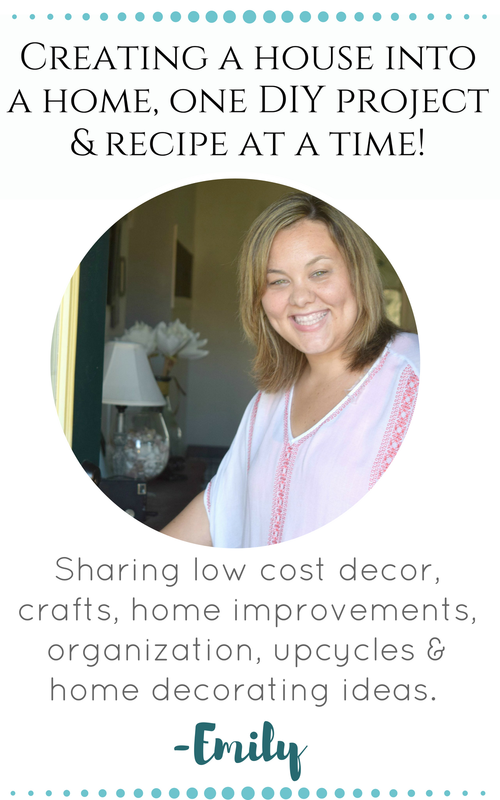 I am a planner and decorator and I get to combine the two with these plans, I am amped up! As far as this Changing up the kids bedrooms, I need opinions from people who grew up sharing a bedroom with their siblings. How was it? Did you like it? Or maybe you hated sharing a room? What about the people who grew up with their own bedrooms, did you wish you could share a room with your sibling? Let me know your experience. My goal as a parent is to minimize the need for future therapy for my kids. I am a worrier by nature, I worry what this room change will do for them, I worry what it will do to my daughter if I do not let her share a room with her beloved brothers. Pretty much, I worry! What do you think, am I crazy for doing this? Any tips or things I should consider? Let me have it, I can handle the truth. I grew up sharing a bedroom with my sister and looking back, I wouldn’t have it any other way. As teens, we would daydream about having our own rooms, but when all was said and done, we wouldn’t trade those fun times for anything. I say go for it and I love that your kids are so close. That is great to hear that you enjoyed sharing a room with your sister! I grew up an only child until I was 12 when my brother was born. I always wanted a sibling close in age to me. I think you did an amazing job on the room. I am no help on the siblings sharing a room though. I’m an only child and always had my own, which I personally loved. But it’s also all I ever knew. I have two kids and they have separate rooms, but there’s a 5 year gap between them. I am still trying to figure out how to make the room sharing work, it is a fun job for me to tackle! Must say the room turned out beautiful. Love the the built ins and work places. Personally we would never put our boys and girls in the same room. They need privacy. I know a lot of people feel this way about different genders sharing a room. I am still trying to figure out how to make the sharing of bedrooms work best for our family. It is a work in progress. I have had a few people mention that as my kids get older there can be an issue. I know that this is a plan with a serious expiration date, which is the reason I have not gone 100% into it yet. Your bedrooms are beautiful and your kids are lucky. Do remind yourself that this change would be temporary and it might only last 6 months…..are you ready to re-do all the work? I also know what it feels like to be appart from your siblings…I’m an only girl with 4 brothers and I had my room while the boys shared one room,(no ill effects but still had fun sneaking in each other’s room)…but I also have 3 children (1 girl and 2 boys) and for a few years my daughter and son shared a double bed while the baby had the nursery. This made bedtime easy for us. What is wrong in leaving the rooms as they are and let the kids sleep together in your daughter’s room when they feel like it. Remember this is very temporary, your daughter is probably the one who will outgrow this first. Let them enjoy their togetherness but explain to them that it is a lot of work and cost. Kids need to learn resilience and one way that they learn this, is by letting them figure out ways to enjoy each other without adult intervention and/or being given everything that they want. 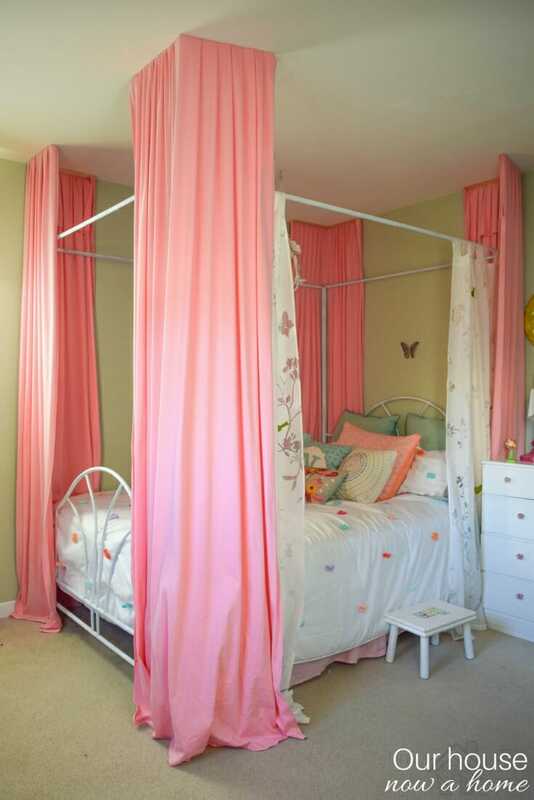 Because of your daughter’s age (9) I would not recommend you combine the bedrooms because it can be very temporary. This is so interesting to hear from a point of view of the only girl in a family of boys. I know it is hard for my daughter at times to be the only girl, I try to minimize those feelings for her as much as possible. I love your idea of leaving the rooms separate but allowing more use or flow between them. You bring up some good points about encouraging them to work around the struggle of them wanting to be together. I love that I got such thoughtful responses like this, it has made me pause and consider other details and points of view. Thank you so much for sharing your thoughts on this! I am leaning more towards not a full changing of rooms, still a lot to figure out though. Wow, I love how you maximized the space. 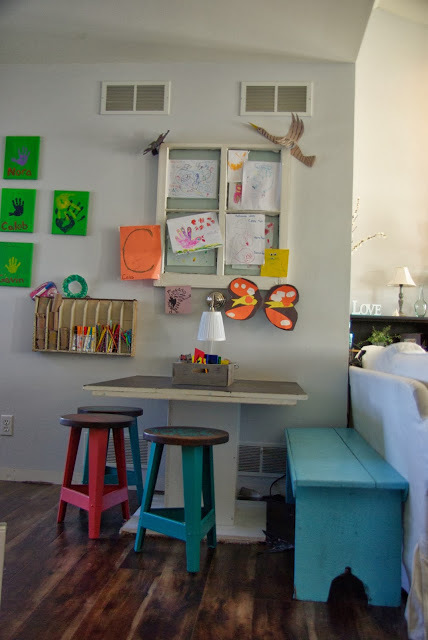 Best of all, I adore how you made it a gorgeous living space for all of your kids. Great job! Thank you! These are how their bedrooms are now, I was simply showing how it is all set up and then explained my plans for a potential room change. Sorry it was confusing. Great job on the room. My sis and I shared a room for pretty much all of our childhood. My daughter has her own room and the 3 boys shared a room well into elementary school and then 2 ended up sharing a room (ironically the eldest and the youngest) and our middle son has his own room. The kids worked it out as they grew older and it works for us. 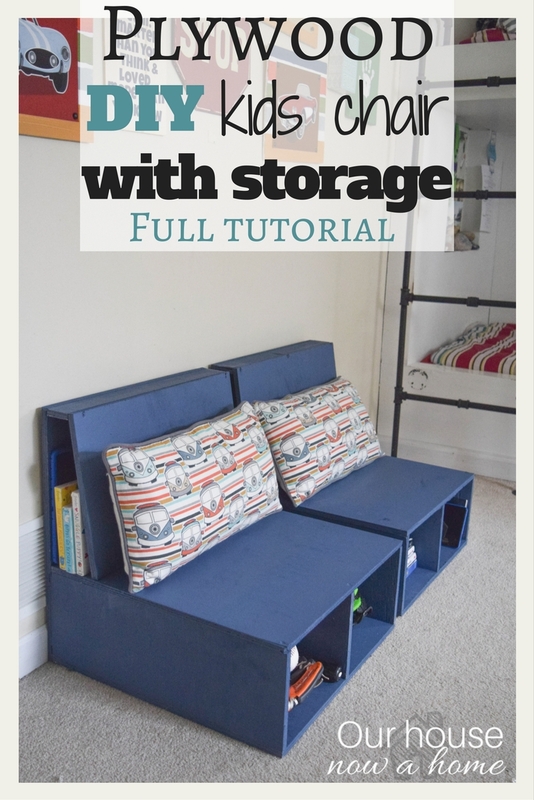 That is great to know that your kids are willing to work together to figure out the best room sharing set-up! I know a lot of people think this way. For us, it does not feel like too much of an issue. They all get dressed on their own in the bathroom with the door shut which allows each of them that personal privacy. But, as you pointed out, each home and family is different with different comfort levels. My almost 9 yr old daughter and my 6 yr old son have shared a room their entire lives and I sort of feel like that is what has led to a lot of fighting and maybe too-much-time-spent-together induced dislike. They still play together and love each other but man, do they fight! we’re in the process of creating a space in our 100 yr old house basement to serve as the office/den so we can convert upstairs den back to a bedroom to separate the kiddos. might be a grass is always greener on the other side of the fence deal? my daughter desperately wants her own space. my son, is not super excited but that’s fear related so a different ballgame. I grew up sharing a small 8×11′ bedroom with my two sisters! for real. there was room for a set of bunk beds and a single bed and one tall, narrow dresser..just barely enough room to fit the vacuum between the beds; it was tight. oh and the closet was 3′ wide and just deep enough for hangers. seriously, how we did it, I will never understand. we lived on a farm and had a really small house but lots of room outside, I guess. my mom still lives there. her new two car garage is actually larger than the house. but, I digress. we always wanted a dreamy second story with individual bedrooms but a small family farmer didn’t have the cashflow for that. we survived and are great friends now. we spent zero time in our bedroom and all our time in the living room. dining room table was where we did projects, played games and did homework. mass chaos, yes but our only option. there was a time when my mom caved and let me have my bed in the living room(open concept, mind you) just to give us space but that was probably freshman in high school so a different time than you’re considering. hmm, I guess I’d say there’s no real reason you need to redecorate in order to let them just share a sleeping space. I know it could be fun to do so but why not just start moving all sleeping/bedtime routines into one room for 6 months and not attempt to separate them or start separate? Ha ha, I will be having a rummage sale this spring with tons of home decor items and maybe some gender specific decor items! 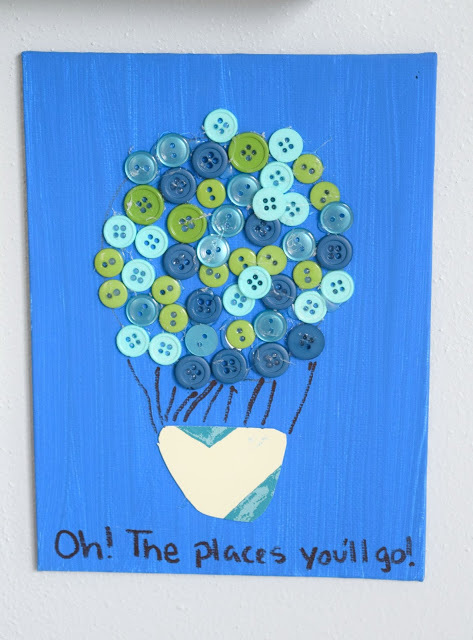 You can come and shop away! I love hearing your experience with sharing a room and growing up in a small home. We have an average sized home and our rooms are actually very generous in size so that is luckily not too much of an issue. You bring up a lot of good points about my daughters age. I love getting other peoples input on this idea, it has made me think about things differently. I am now considering a different set-up with still designated separate rooms but where they feel they can move between them freely during the day. Still a lot to figure out. I am envious of your 100 year old house! I would have loved to go with an older home, so much charm to them! I love the new bed and the space. I always shared a room growing up and I’m not sure if I would have liked having my own or not. That is a tough call. Thank you! These pictures are actually how their rooms are set up now, sorry for the confusion on the pictures. for years my sister and I shared a room with bunk beds. my parents idea of decorating was to buy matching beds/desks, etc.. I was pretty dull and boring. It was until we moved into a bigger house where we got our own rooms that our respective rooms had any life. I love all the ideas you incorporated especially since your kids are not the same gender. Kudos! Thank you! These pictures are actually how their rooms are set up now, sorry for the confusion on the pictures. It can be hard to decorate a shared space for kids, keeping everyone happy with the space is difficult. Looks like you definitely pulled it off!! Love those DIY plywood chairs. 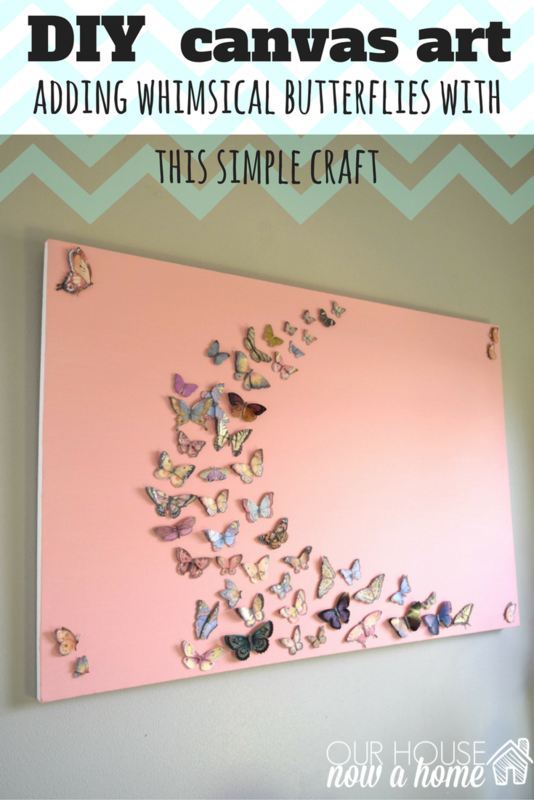 I may just need to make one sometime! Thank you! 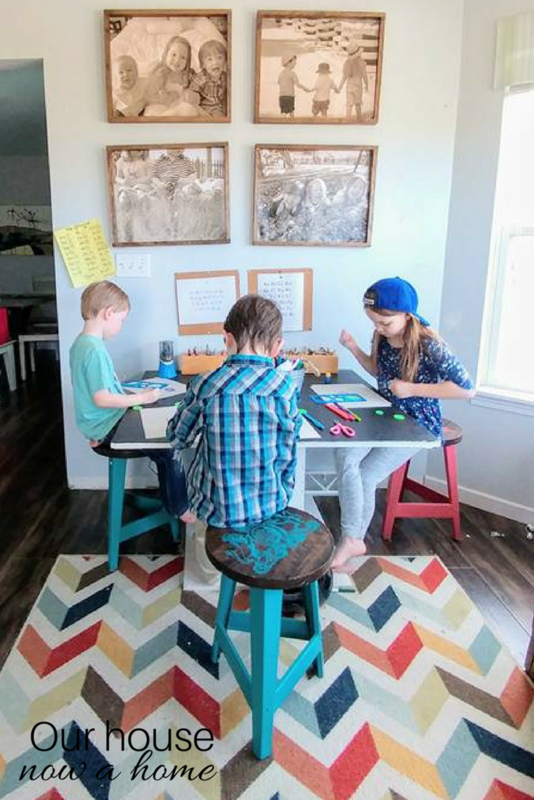 The plywood chairs are a favorite for my kids. These pictures are actually how their rooms are set up now, sorry for the confusion on the pictures. 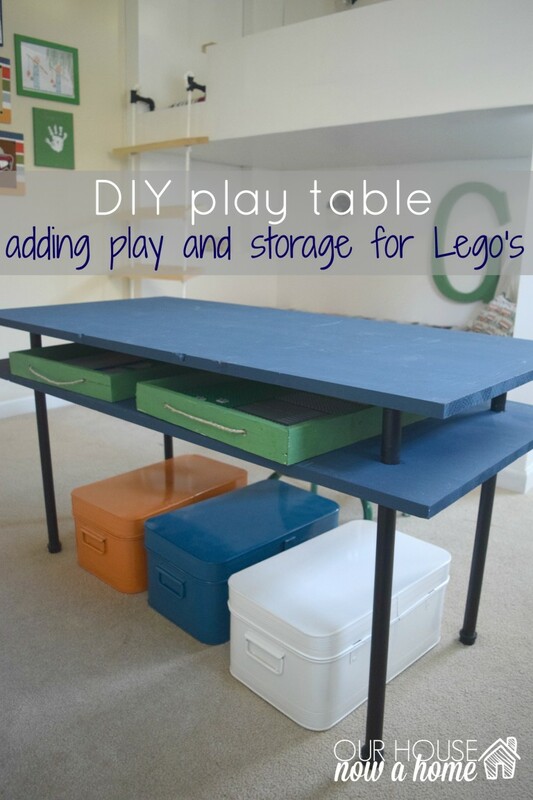 I liked that you have nicely organised items and create the plenty of space for kids. Amazing job. Love this post!! Your kids are going to love sharing a space. My girls have their own rooms but they spend almost every night in the same space. They are the best of friends :). Can’t wait to see the finished product. Thank you! How awesome that your girls are close too! It is such a a special bond siblings have. This is awesome. I love what you did. As a mom of an only child, he has always been opinionated about what he likes. I can’t imagine having to create space for three. You are a rock star. It is tough to juggle all of the kids with their own very strong opinions on things. These pictures are actually how their rooms are set up now (before any changing or combining of rooms has been done) , sorry for the confusion on the pictures. Your bedrooms look great! We have three boys, three girls and totally get trying to make everyone happy. 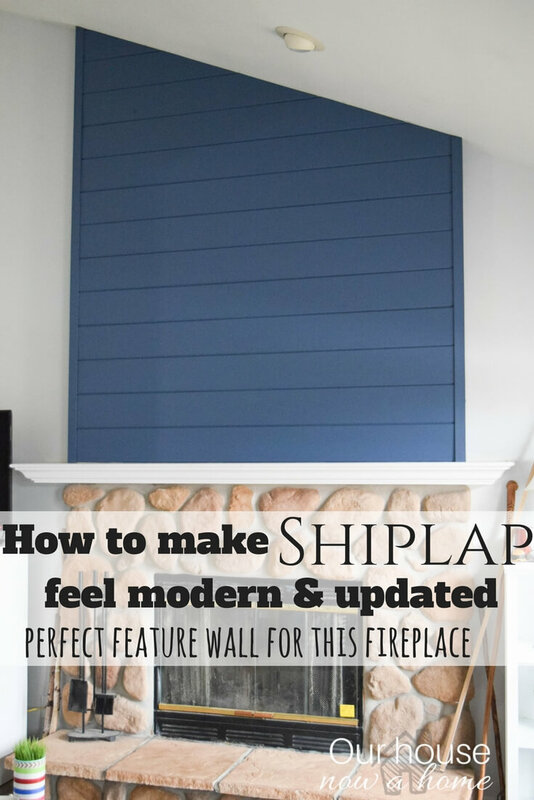 We’ve divided wall areas for decor to make them all have a way to decorate. 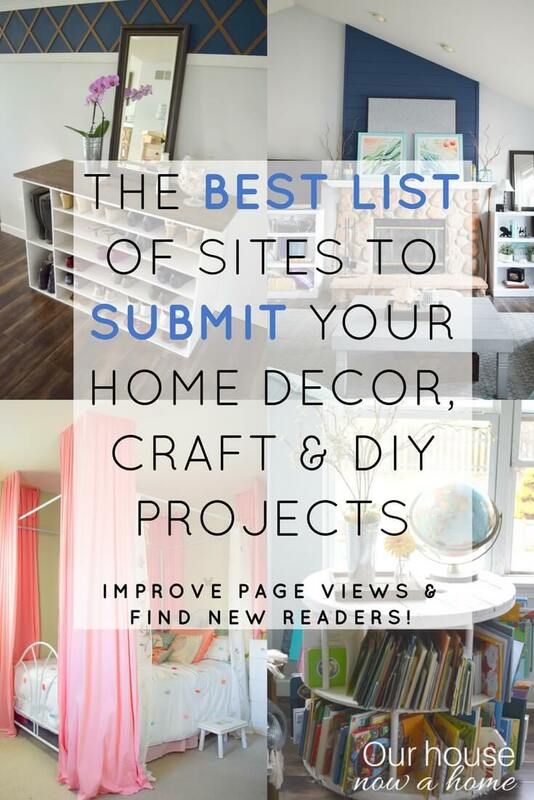 Wow, you have had to get super creative to make your home work! I always wanted a bigger family but three kids was our stopping point. Sounds like a good idea. I think it’s great they like to be around each other so much. Good luck! Thank you! I love seeing their bond be so strong! I think most of the commenters missed the point:) I agree withyou that its saying she’s debating changing it from these pics of the current rooms to be a joint space. VMM, you got it! I was not thinking this would be confusing with the pictures but I should have made it more clear. I will go back and edit this to make the point that these pictures are of their current rooms (pre room switch). I have loved hearing everyone’s stories on their room sharing experience though! Stacy, it seems there was a little confusion, sorry about that! The pictures is me sharing how their bedrooms look now, I should have made that more clear. I am talking and explaining my plans to change around their bedrooms. I wanted to get some other opinions on this since I love talking home decor so much. There is no finished bedroom yet for my three kids. Again, really sorry it was confusing. It’s so sweet that your kids are all wanting to share the same room! My dad was in the military, so growing up, I had bouts of living with my brother and having my own room. Then my dad got remarried, and I had to share a room with my new sister. I personally liked having my own space because I was neater than my siblings. When I was younger, I also liked having all my toys on display, and I couldn’t do that sharing a space with my brother. We also have a 4 1/2 year age gap. I definitely think it just depends on the siblings. My kids were four years apart, so this never came up. They always liked having their own space and time apart from each other. I was an only child so I didn’t ever share a room. I wished I had siblings though. Sounds like a great idea! It’s so sweet that they all want to be together. Can’t wait to see what you come up with! Thank you! I love seeing their sweet bond grow each day! I always shared a room with at least one sibling. There were good days and bad. The hardest part was when I was a teenager and needed space from my much younger siblings. Also. I am obsessed with your bunk beds! They are so awesome! Thank you! The bunk beds were a lot of work but sooooo worth it! I have heard many people mention that as they get older having their own space will become important. WOW you did an amazing job! 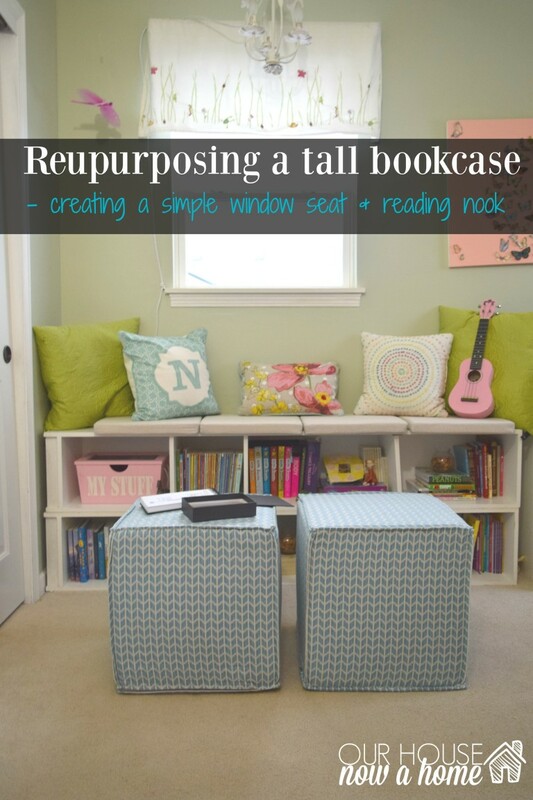 I love how you turn the room into a playroom and the results of your kids’ bedroom. It is so sweet that they’re sharing the room together. Thank you! These pictures are actually how their rooms are set up now (before any changing or combining of rooms has been done) , sorry for the confusion on the pictures. I love the idea of sharing a space, mostly because I know from our experience that the bedroom doesn’t get a lot of use other than to sleep …. so why waste the square footage on 2 other rooms? Great point! My husband and I were just joking last night about how we could have a massive home but our three kids and two dogs will still follow us from room to room anyways. 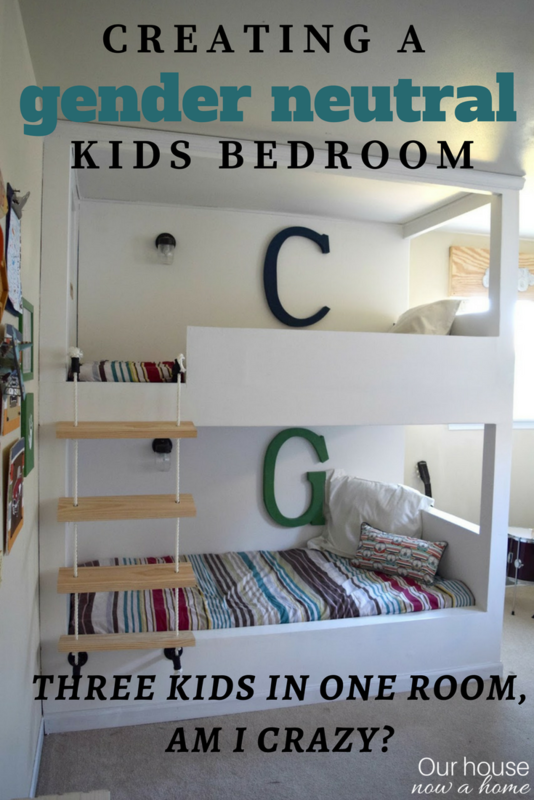 Very nice ideas that can be applicable to other bedrooms too not necessarily kids bedrooms. I guess if there is no space there is no other option but sharing when kids are still age appropriate to share a room. When growing up I always had my own room so I think is nice to provide the kids with their own room to if we have the means to do so. Thanks for your input! I am loving getting others opinions on this, it has made me consider a few points I had not thought about before. 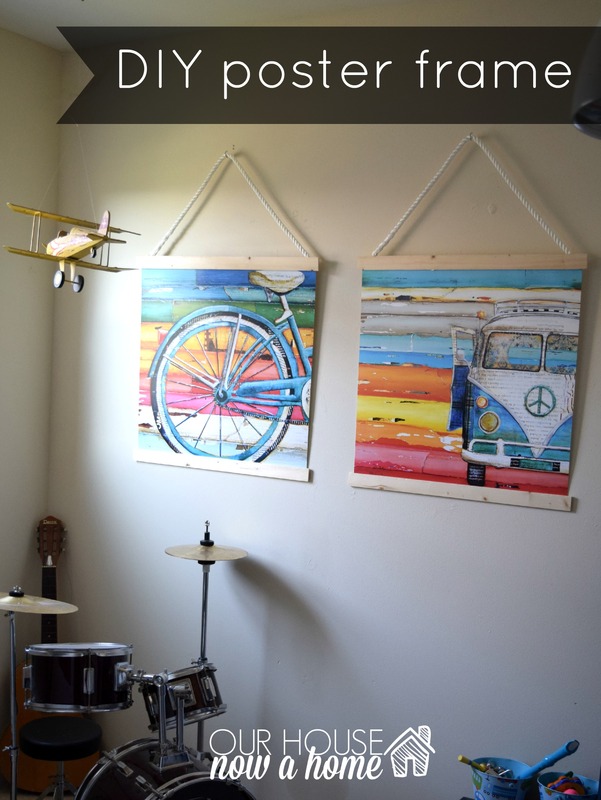 We do have the space with three bedrooms total in our home and they are a generous size. This is more of a choice that my kids have been begging me for. We will see how it all works out. Lots to figure out still. I would just want to say that hey, whatever works for your family is good. I know no one knows your kids better than you and I am sure their bond as siblings is great that they are willing to share a room together regardless of gender. Kudos to you! Thank you so much for these kind words! Each family is so different and what works for one would not work for another. 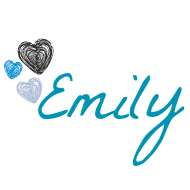 I am still figuring out everything and have loved getting other peoples thoughts on this. A few really good points have been brought up that have made me consider a slightly different idea, I will see how it works out. I had to share a room with my sister growing up and HATED it but that was just me. I think we always want what we don’t have…LOL! Very true! I always wanted to have a sibling to share a room with growing up, it seemed like such a fun way to live. But I know many (including my husband) that would have loved their own room growing up. I think it is so sweet that the kids are one unit. It would be great to let them share the same bedroom, at least till they grow out of it and wand independent rooms. I love seeing their sweet bond grow each day! I am not sure how to make this work yet, still a lot to figure out. I have enjoyed getting others thoughts on this! In the country where I grew up in, we shared bedroom with our siblings. I have 5 sisters and we only had one room for all of us. It was chaotic but we managed to make it work. Wow, that is a lot of kids in one room! I know that many places this is very typical. I love the idea of being a close knit family and making the space work to encourage that close feeling and bond. Love the transformation. I grew up in a large family so a few of us shared the same room. These pictures are actually how their rooms are set up now (before any changing or combining of rooms has been done) , sorry for the confusion on the pictures. 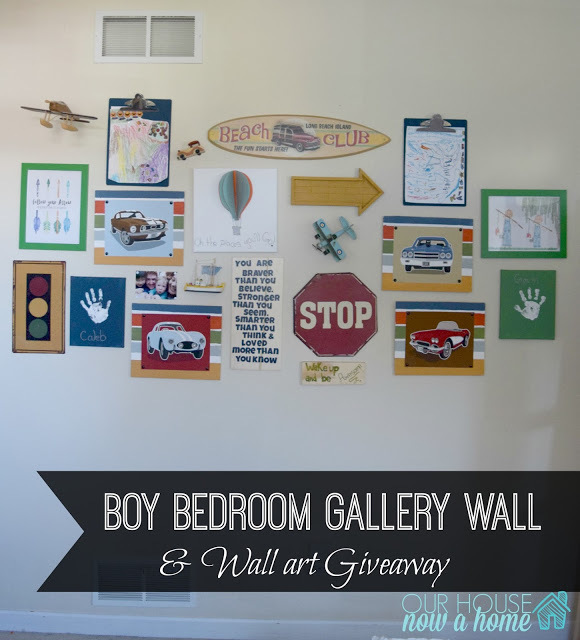 I think this is an amazing idea as long as the kids like it and you don’t knock down walls you can always move it back one day. I love how close your three little’s are although they are not so little anymore! As their Grandma and your Mom I am very biased on that subject though..wink..wink. But honestly I love this idea and say…go for it..more power to ya! I know whatever you do will come out amazing! You have to do what works (or what you hope works) for your family! No one but you knows the dynamics of your children and I appreciate your story. The elements of the room are amazing! 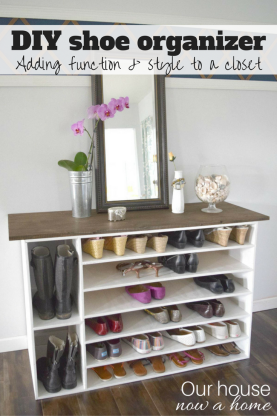 I love how you organized the rooms and furniture. The kids have everything they will need, want and enjoy while playing.